I studied for my BA at Royal Holloway, for my MA at the University of Sussex and returned to Royal Holloway for my PhD. My thesis on Marcel Duchamp offers an account of the decline of European easel painting through the lens of the decline of traditional metaphysics. My research is focussed mainly on modernist visual art and literature, with a particular interest in lyrical and idiomatic forms of expression. I also have an interest in public health policy and worked as a researcher on Lord Norman Fowler’s book Aids: Don’t Die of Prejudice (published by Biteback in 2014). I am currently a Teaching Fellow in the Media Arts Department at Royal Holloway, University of London, convening courses on film history and the modernist avant-garde. 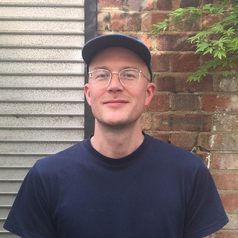 I am also a director of the Peckham Pelican, a South East London arts hub which hosts a variety of interdisciplinary and cross-media events and exhibitions, providing a platform for local artists, activists and entrepreneurs.